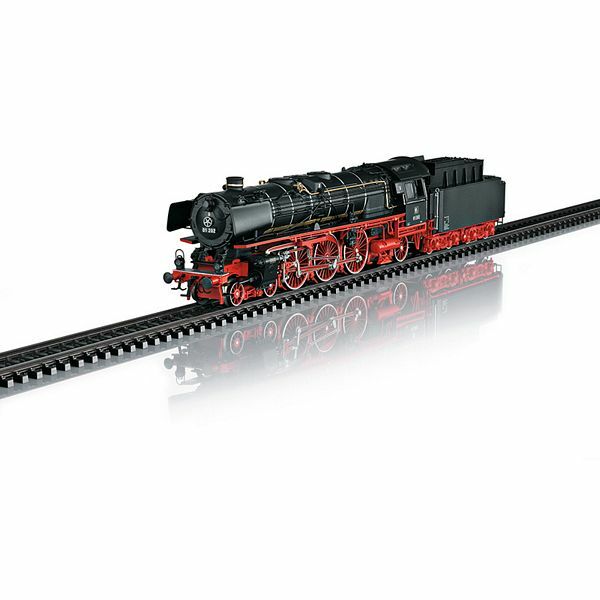 Model: The locomotive has an mfx+ digital decoder and extensive sound functions. It also has controlled high-efficiency propulsion with a flywheel, mounted in the boiler. 3 axles powered. Traction tires. The locomotive and tender are constructed mostly of metal. A 7226 smoke unit can be installed in the locomotive. The triple headlights change over with the direction of travel. They and the smoke unit that can be installed will work in conventional operation and can be controlled digitally. The locomotive has firebox flickering that can also be controlled digitally. Maintenance-free warm white and red LEDs are used for the lighting. There is a permanent close coupling with a guide mechanism between the locomotive and tender that can be adjusted for track curves. The rear of the tender has a guide mechanism and a close coupler with an NEM pocket. A mechanism is built into the tender to lower the coal load in order to represent visually the consumption of coal in the tender in the World of Operation mode. For digital central controllers without mfx+ the lowering and raising of the coal load can be activated by means of special function F8. The minimum radius for operation is 360 mm / 14-3/16". Protective piston sleeves, brake hoses, and figures of a locomotive engineer and a fireman are included. Length over the buffers 27.5 cm / 10-13/16". Standard Design Steam Locomotive, Road Number 01 202 The class 01 was the epitome of German express steam locomotives for many years and almost until the end of steam motive power in both German states. Neither lay people nor railroad personnel could escape the fascination with it and the way it conveyed power, elegance, and speed. 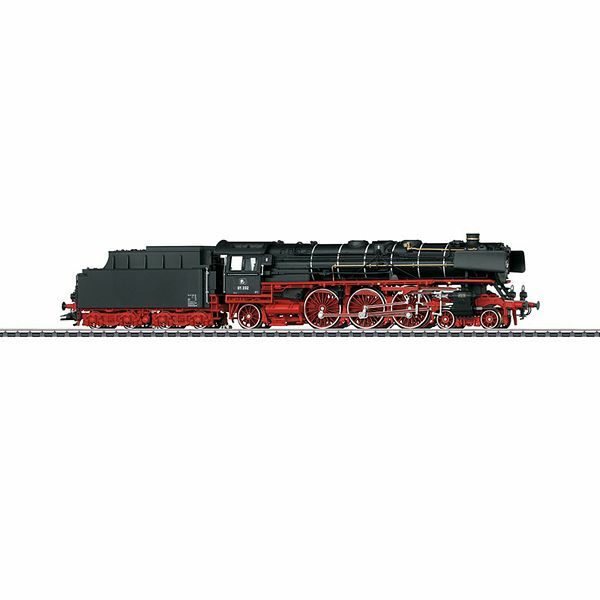 The German State Railroad Company (DRG) was established in 1920 and in its first type plan the classes 01 and 02 were included as a two-cylinder and a four-cylinder compound express locomotive that were identical in all other respects. After conclusion of comparison tests with ten each pre-production locomotives of both classes the dice fell in favor of the two-cylinder unit and regular production began in 1927 with road number 01 012. Procurement of this locomotive type did not end until 1938, a period of more than twelve years that resulted almost unavoidably in various design changes. The design was totally overhauled before the production run of the third series (01 102-190): While road numbers 01 102-149 still had a copper firebox, the steel firebox was introduced starting with road number 01 150. The firebox and the boiler now had a larger number of cleaning holes and the piston type feed water pump was replaced. The frame design was reinforced and the running gear was improved as was the suspension springing and the braking system. This allowed the permissible speed to be increased from 120 to 130 km/h / 75 to 81 mph. The design changes on the last series delivered (01 191-232) by contrast encompassed only the replacing of the standard piston valves by pressure balance valves designed by Karl Schulz. After World War II, 171 units remained on the future DB, which lost their "large ears" in favor of the small Witte smoke deflectors. Some of them also got rid of their front skirting. The last stronghold for the DB class 01 units was the Hof District until 1973, where road number 01 202 was also in use until the end. In 1975, the Swiss Werner Bühlmann from Münsingen bought the locomotive and had it brought to Switzerland by October 2, 1975. Here it was brought back to operational condition in almost twenty years of work at great expense by Werner Bühlmann and a group of incorrigible optimists. In 1989, the association "Pacific 01 202" was founded with the goal of keeping road number 01 202 operational, and since 1999 road number 01 202 has found a permanent home in Lyss in the canton of Bern. Starting in November of 2011, road number 01 202 spent two years at the maintenance facility in Meiningen for its scheduled main overhaul. While there, it was equipped with PZB and GSM-R safety equipment so that it could now do special runs in Germany.